The first Sanlorenzo superyacht with interiors designed by studio Citterio Viel has been delivered to her Scottish owners and named Kathleen. Part of the Sanlorenzo SD112 series, Kathleen measures 33.65 metres and was ordered as an upgrade to the owner’s previous Sanlorenzo SD92. The Citterio Viel interiors on Kathleen evoke “the atmosphere of the grand private yachts of yesteryear”, the Italian yard explained. 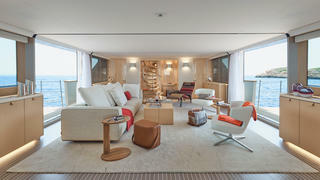 This meant completely redesigning the living area, with new detailing to emphasise the high levels of luxury on board and “consolidate the unbreakable link between home and yacht”. 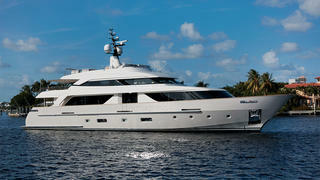 Key features include two fold-out superyacht terraces, one on each side of the yacht. Accommodation is for ten guests, split between five cabins, including a full-beam owner’s suite on the main deck and four guest cabins on the lower deck. Exterior relaxation space is split between the aft deck and the extensive sundeck area. A curved superyacht staircase leads down from the upper deck dining area to the saloon, which features light tones and red accents. Twin MTU diesel engines give Kathleen a top speed of 17 knots, while her total fuel capacity of 23,700 litres should translate into a decent cruising range on the open water. Although this is Citterio Viel’s first superyacht project, the studio has extensive experience in the luxury sector, with previous clients including De Beers, W Hotels, and Bulgari Hotels & Resorts. Sanlorenzo has also commissioned the Italian studio to create the interiors for an upcoming 42 metre EXP460 explorer yacht, which is currently under construction for a Swiss owner.